Betty holding our son Griffin. 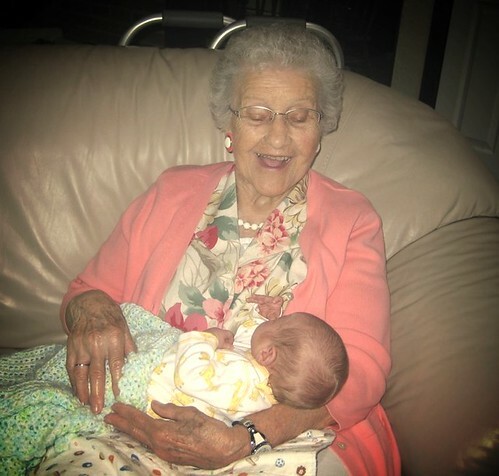 Annie’s grandma, Betty Ludwick, recently passed away. She was 93. She listened and she loved. She humbly led a life that led others to listen and love. If you spent five minutes with her, you felt like one of her grandchildren. That’s why I was so honored to read the tribute below written by Betty’s three granddaughters at her funeral. Stephanie, Emily, and Annie did an amazing job writing this. It is touching and funny, and most of all it’s Betty. Even if you weren’t lucky enough to meet her, I think you’ll enjoy it. My hair wasn’t brushed, neither were my teeth. I wondered down zombie-like to the hotel’s continental breakfast. My eyes weren’t really working yet, but it wasn’t hard to discern that Temple Grandin was sitting in the lobby on the phone. If you aren’t familiar with Temple Grandin, she’s sort of a patron saint of the autism community. Born with autism, Temple has been able to make an impact seeing the world from a different perspective. She was played by Claire Danes in a movie and is a rockstar speaker at events across the country. SHE IS A BIG DEAL, especially to parents like me with a child on the autism spectrum. I carry a gold nugget in my wallet. A slave owner in Burkina Faso gave it to me. The bus ride that took me from Burkina Faso’s capital, Ouagadougou, ended at a flooded road and a trip in a tiny dugout canoe where the oarsman joked about crocodiles. From the canoe I got in a taxi that didn’t have brakes. The driver stopped the car using the “Fred Flintstone” method – sticking his foot out the door and dragging it along the road. By Kelsey // Engaged Consumer, Simplify, Where Am I Wearing? Rocking my prAna Fair Trade T-Shirt at the Midwest Writer workshop. Apparently I’m about to drop an F-bomb. 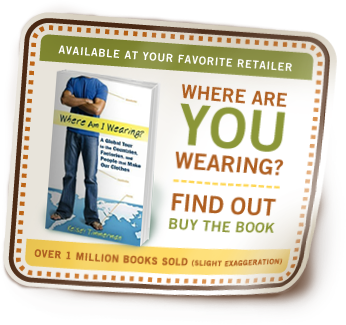 The post covers how a T-shirt changed my life and how excited I am that Fair Trade certified clothing exists…. The sun poured through the glass walls of the library and made me even more aware of the fact I was wearing a hot and itchy suit. “Man this suit is hot,” I said to Jessica Brockmole, one of my fellow Emerging author finalists at the Indiana Authors Award. She socially appropriately acknowledged my statement. And then I went on. The more dressed up I get, the more socially awkward I become. It’s a law that is as true as gravity to me. I was scrolling through Facebook, wasting time, not expecting to see a picture of a picture of me on a Jumbotron in Times Square. Why would I? The Eugene and Marilyn Glick Indiana Author’s Awards had shared the photo. I haven’t officially mentioned it here on my site, but I won the Emerging Author Award. (I should write about that later. It was an awesome evening and honor.) The photo featured Norbert Krapf, the regional award winner, Michael Shelden, the national award winner, and me . . . in a suit . . . a borrowed suit. I never wear a suit.